It’s hard to know where to begin with Broad Street Bakery. Since first opening in 1998, Broad Street has been the cornerstone of Banner Hall as well as Northeast Jackson. For me, Broad Street has always been first and foremost a bakery. If BBQ shrimp is on the menu, I can’t start peeling until I get a loaf of French bread from Banner Hall. Of course, there’s more to Broad Street than a myriad of breads. It’s been a relatively short while since Broad Street unveiled their new menu, but over the course of four visits, I did my best to get an idea of what Dan Blumenthal & Jeff Good had to offer. During my first visit, I quickly realized that to the uninitiated, looking through the menu at Broad Street quickly alerts you that this isn’t your average bakery or deli. 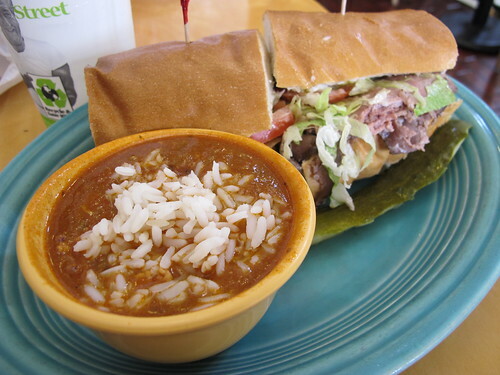 Yes, there’s fresh baked bread and plenty of sweets, but when was the last time you saw gumbo at a bakery? Chalk it up to Jackson’s proximity to Louisiana, but do you really need to rationalize the existence of Smoked Chicken and Andouille Gumbo? 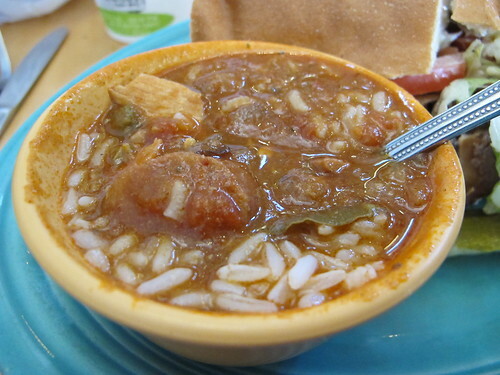 There’s a distinct redness to the gumbo at Broad Street; it almost looks like a cup of tomato stew. Looking past the color, there’s a fair amount of white meat, i.e. dry, chicken and a few sizable pieces of andouille. 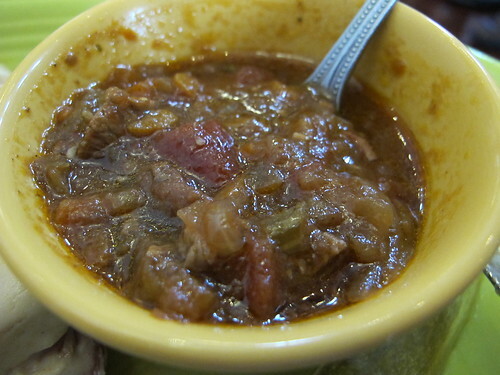 With no deep roux flavor, the tomato is much more prominent that I’m accustomed to but it’s still a pretty fair gumbo. It’s not a bowl of rustic Cajun style gumbo, but not a delicate Creole affair either. 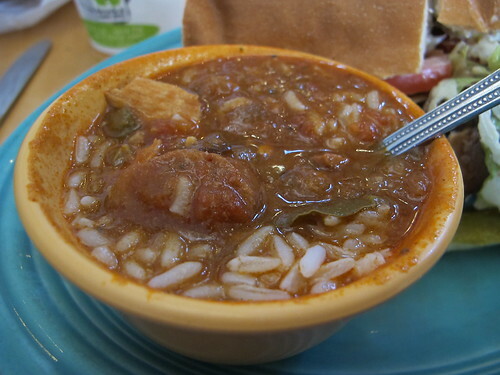 This is just a decent bowl of gumbo from a bakery. 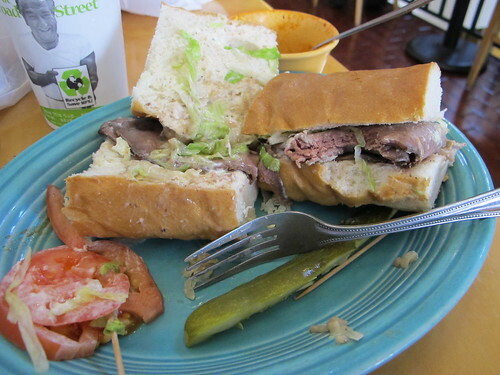 Completing the Nola theme of my first visit, the sandwich that accompanied that bowl of gumbo was none other than Broad Street’s Roast Beef “Debris” po-boy. As much as I love being a patron of all the Mangia Bene outlets, Bravo, Broad Street, Sal & Mookies, this might have been one of the worst things I’ve ever ordered at one of those restaurants. 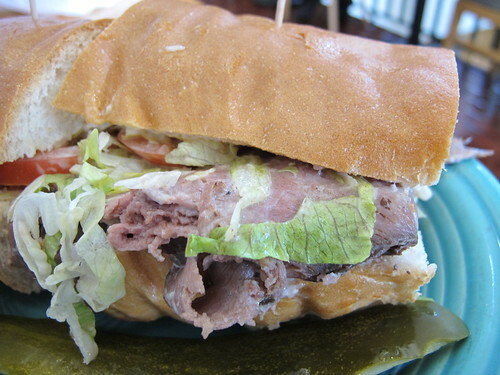 There’s a decent po-boy bread to this sandwich but inside this is nothing more than cold, bland sliced roast beef. I can appreciate the idea of the horseradish spread, but it’s not a good substitution for a classic combination of gravy and mayonnaise on a roast beef po-boy. The beef was cold and listless, there was a pittance of gravy, and the debris was nowhere to be found. I rarely leave things completely uneaten but this was not worth the effort. With the second visit, I decided to leave the po-boy section behind and take a look at their more general Sandwich section. 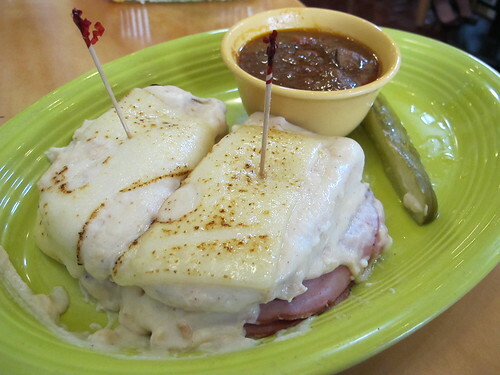 A Croque Monsieur with a cup of beef stew may seem like an odd combination, but it’s hard to turn down beef stew. From the beginning I made a critical error with this sandwich; I tried to pick it up and eat it. 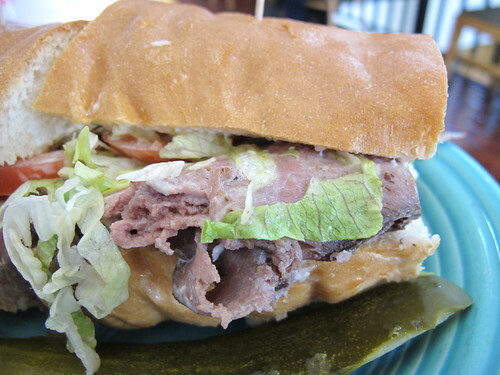 This is an unruly, extremely messy sandwich that should only be eaten with a knife and fork. 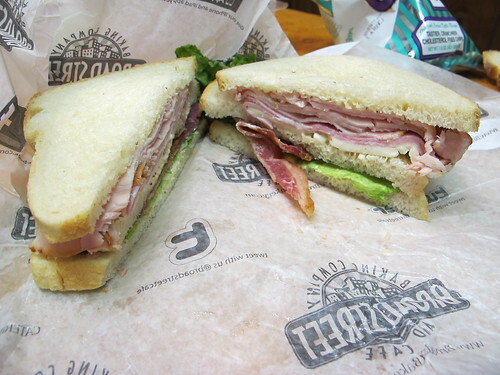 Keeping that in mind, this is actually quite a nice sandwich. There’s a healthy amount of sweet ham and plenty of cheese. Actually there’s simply too much cheese here. 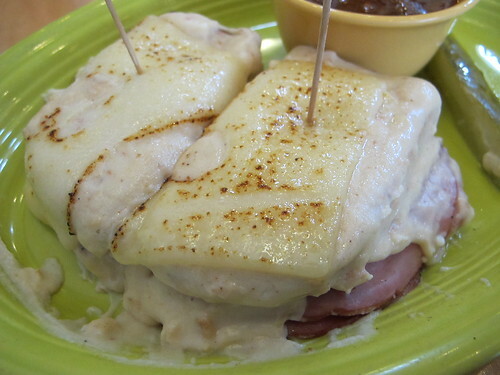 I realize that Broad Street is trying to please with plenty of béchamel, but I miss the crispiness of a Croque Monsieur. 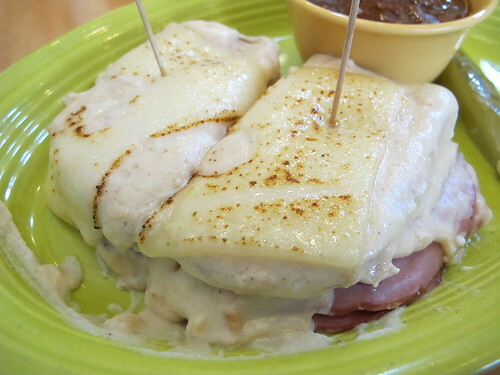 Needless to say, it’s near impossible for one person to eat this sandwich, especially if you devour all the béchamel. Listed as soup special for that day, the beef stew was a nice break from the richness of the Croque Monsieur. I’d actually call this too thin to be a stew, but it’s quite a hearty beef and vegetable soup. With carrots, onions, beef, potato, and celery, it’s a simple soup but perfect for a cold, rainy day. For the third installment of Broad Street Bakery, I decided it was time for the lunch litmus test: takeout. Of course that doesn’t mean I was taking it easy on Broad Street. I was curious to see just how well their quiche of the day would travel. 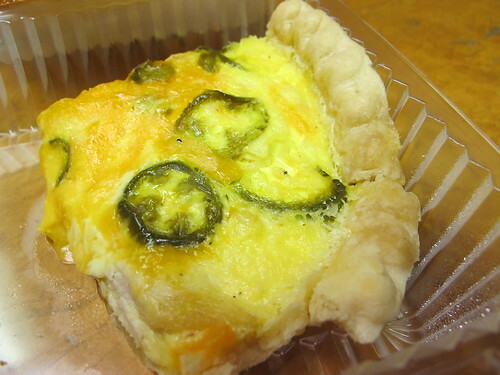 Roast chicken, jalapenos, and cheddar cheese is an excellent ingredient list for a quiche. 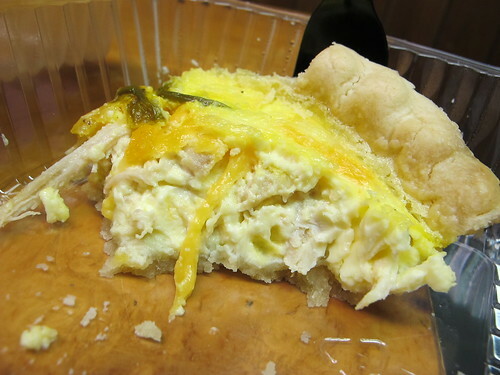 Even with the steam from the takeout box, there was a buttery crust to the quiche. Inside the egg was a surprising amount of shredded, slightly stringy, and just a bit dry chicken. 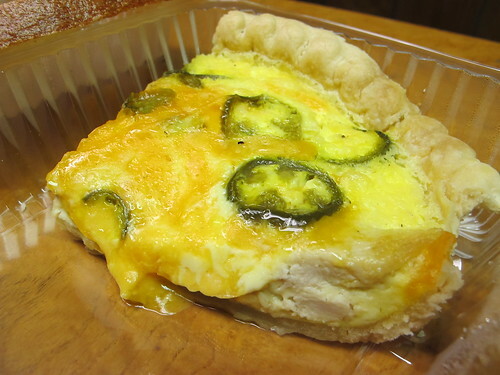 However the dryness of the chicken is quickly forgotten when combined with the cheese and the subtle bite of the jalapenos. This wasn’t too shabby for takeout quiche. While it is quite possibly the most clichéd of all business lunch option, there’s no shame in ordering a Club Sandwich. Yes, that’s a loaded up club sandwich. 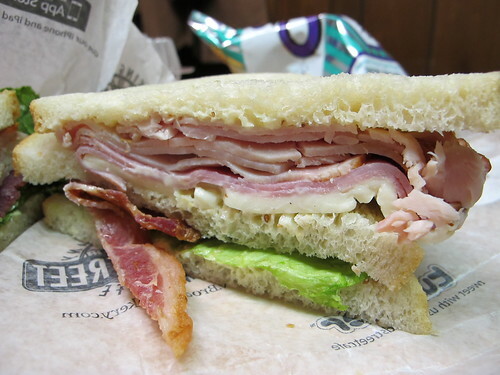 Bacon, ham, turkey, Swiss, honey-mustard mayo, and lettuce, it’s everything I could want in a club. I did think it was a little odd that the Texas bacon had a peanut butter taste, but the overall combination of meats and trimmings produced a tasty, albeit sweet club sandwich. Normally three visits is the most I’ll give a restaurant before a write up, but in my mind a significant part of Broad Street’s appeal is its breakfast offerings. So this past week, I skipped breakfast at home and made my way to Banner Hall. I decided I should save the waffles and omelets for a weekend. 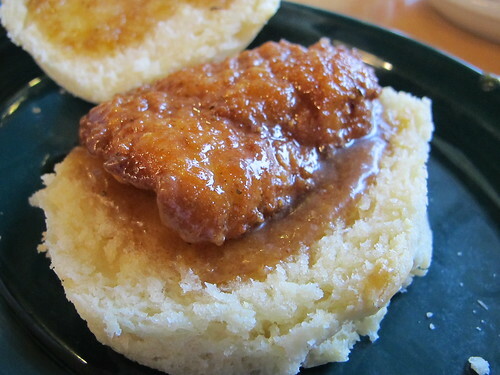 For some reason the Buttermilk Chicken Biscuit just called to me. Maybe it was promise of a flaky biscuit or the sweetness of the maple glaze, but I’m betting it was the fact I’m a sucker for anything labeled spicy. I certainly wasn’t expecting such a large biscuit. 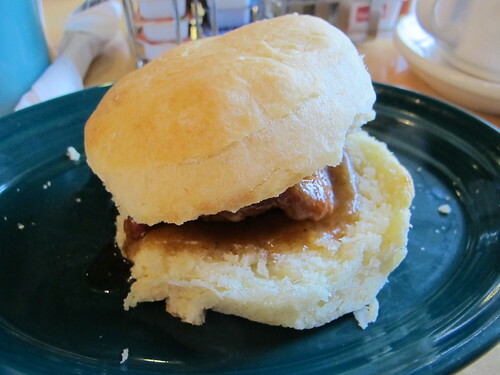 Actually there was little flakiness to the biscuit, it was more like a dinner roll, biscuit hybrid. The distinct layers of a biscuit weren’t really there. 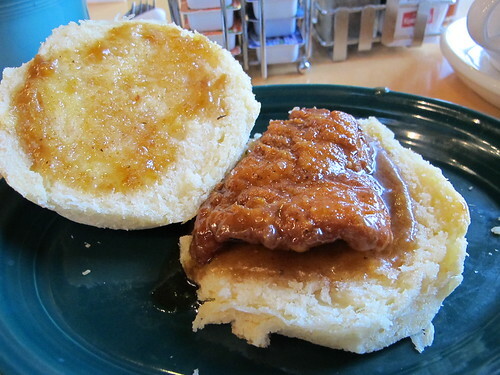 More important than the biscuit was the chicken and I can see why people love this chicken biscuit. Still crispy from the fryer, and fairly juicy on the inside, this was well fried chicken. 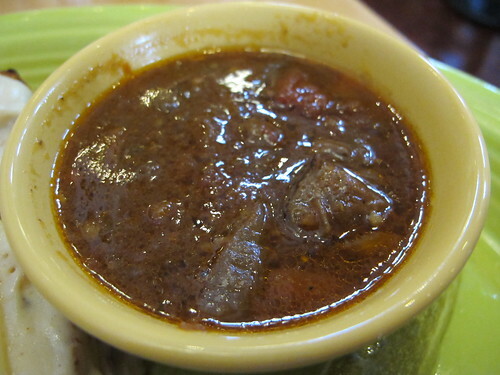 The sauce was an interesting mix with a distinct honey flavor that ended with a spicy uptick. It was like a very sweet hot sauce and it made for a unique take on the classic chicken biscuit. 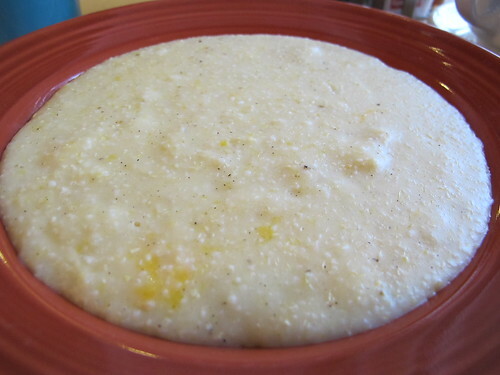 What better way to end than with a bowl of cheese grits? Even though people from outside the South will mock the humble bowl of grits, there’s something satisfying about a well cooked bowl. Here there’s not any artisan, stone-ground texture, these are simple quick cooking grits. There’s a subtle amount of cheese, but with a large dose of pepper and a little salt, this make for a rather mundane, but excellent breakfast treat. While there may have been a few misses on the Broad Street Bakery menu, it’s hard to complain about the overall product. Even with that sorry excuse for a po-boy, there are simply too many positive aspects to dismiss this Jackson hub. Be it breakfast, lunch, an early dinner, or just a run for bread, there’s a reason that Broad Street always seems full. They put out a quality product, and when someone does so across such a wide variety of offerings, people will keep coming back. At least that’s why I keep pulling off the frontage road and into the Banner Hall parking lot. Thank you for an unbiased review. Frankly, having to read on Facebook and Twitter over and over "reviews" from someone who is employed by the business they're review (EatJackson, if I may) becomes irritating... and deceptive to all of those people who have no idea that's the case. A mixed review, fair but positive in the end, is a nice change. Thanks for this. -My pleasure and thanks for reading. Try the buffalo shrimp "salad." 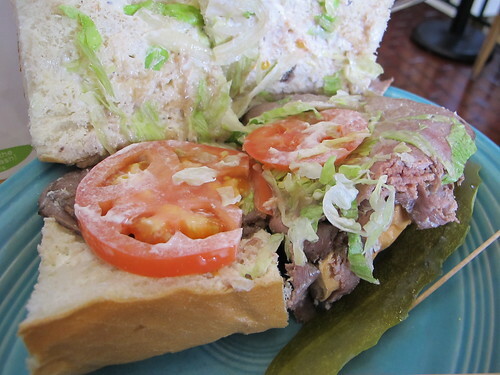 I miss the flank steak sandwich they use to have with the corn relish.... wish they would bring it back! Chef Dan has slipped. Broad Street is living on reputation. My oyster poboy was inedible. It was cooked to a hard rock. Shrimp poboy was greasy and little iodine shrimp. Not plump. The turkey sandwich had two slim pieces of turkey and very thin slice of cheese on a bread that I didn't order. Service is sloppy and waiters look dirty. There are other and better choices in Jackson today.